An Ethereal Bohemian Inspired Wedding At Standlow Farm With Tipis From Papakata, A David Fielden Dress And Juliet Cap Veil With A Sweet Avalanche Rose Bouquet. If you’ve signed up for the awesome publication that is the Rock My Wedding newsletter* then you’ll already have seen a sneaky peek of the epicness of this morning’s wedding. We couldn’t hold back any longer, after all we’re practically half way through this month (I know! Already!) so this morning we decided to share this fairytale of a wedding with you. Trust me ladies, if you’re of the bohemian, ethereal, hippy fairytale persuasion then this one is for you. There’s also a splash of Moroccan adventure and festival fever in the mix as well. Anyone that reads the blog regularly will know that I’m a sucker for exquisite florals and this beauty of a wedding is no exception; I adore Sarah’s bouquet and the table centrepieces slot perfectly into the overall vibe of the laid-back decor. But it’s Sarah’s sartorial choices that have blown my mind. Her dress, veil and headpiece are quite possibly my favourite to ever appear on the blog and given the plethora of pretty that appears on these pages daily that really is a bold statement to make. 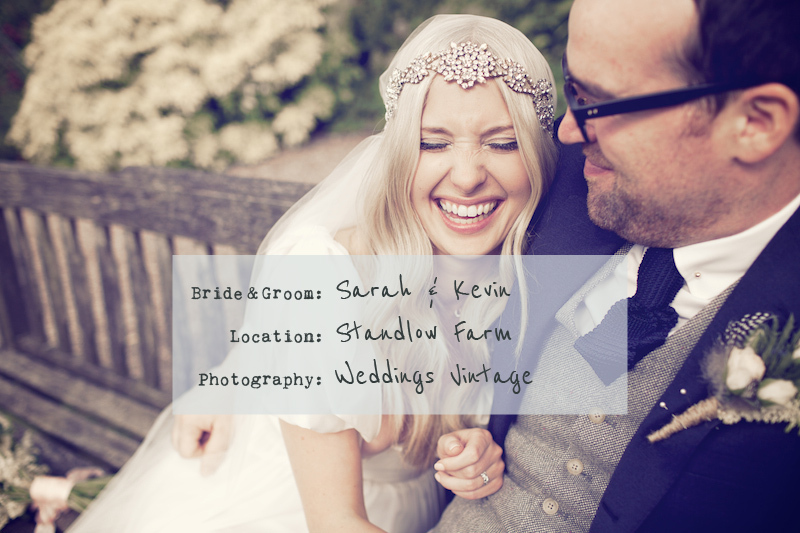 Sarah The Bride:From the very beginning of our planning we knew we wanted a venue we could hire for a long weekend that could accommodate all our immediate family and close friends so the fun could last as long as possible. We also wanted it to be in the Peak District, even though we both live in Manchester we spend a lot of time in the peaks and it’s somewhere that’s close to our hearts. This resulted in what felt like the longest venue hunt in the history of wedding planning. Just as we felt like giving up we found Standlow Farm near Ashbourne. It couldn’t have been more perfect, 5 beautiful cottages, a farm house, a games room and a huge paddock to put up venue hunt number two – the amazing Tepees!! It also meant we could invite all our guests back the next day for a BBQ. The Tepees were supplied by the even more amazing Papakata. As soon as we saw them on one of their open days we knew that nothing else could even come close. The Papakata team have got to be the best company I have ever had the pleasure to work with. They are so passionate about what they do and just want to share the love, they made everything really easy and there was always an excited and enthusiastic helper at the end of the phone whenever we needed it. I did my hair myself on the day, I have quite long hair and I knew that wanted to wear it down as it really suited the feel of the wedding so I really didn’t need anything doing to it. I had my make-up applied by Kevin’s sister Grainne; she is a qualified make-up artist which was very handy. It was really important to me on the day that I looked like me; I don’t wear lots of makeup normally and I had a few trials that didn’t go well but Grainne understood exactly what I wanted (without a trial) and I felt amazing. I had my nails done at Selfridges a few days before, French manicure isn’t very me so I just went for very pale pink gel nails to avoid the chipping that normally happens within minutes of nail varnish coming anywhere near me! Grainne also did all the bridesmaids’ hair, I wanted them to have something quite unstructured and she came up with idea of using plaits which looked brilliant and really suited the look I was trying to create. This was probably the easiest part of the planning, I trusted in her skills and just let her do what she thought would look good and the results were stunning. I work as a personal shopper and love fashion so the dress was always going to be a really important part of the whole experience for me. However once I started the big dress hunt I realised that I don’t really like wedding dresses. I know to a lot of brides this sounds completely crazy but every dress I put on I felt silly in, I felt like I was playing dress up and nothing seemed to work. Then I found a beautiful vintage dress purely by chance which I snapped up but it needed a lot of work to make it fit and look the way I wanted it to, sadly in the end it wasn’t meant to be. This as all you brides can imagine was pretty heart breaking, 5 months before the wedding I had to start my dress hunt all over again eeeek!! I remembered being recommended Silk Brides in Lichfield by someone early on in the dress hunt process and went on their website, I couldn’t believe it but they had a sample sale on the next day and as fate would have it they had one slot left. My sister came with me; I went through all the rails and pulled only one dress out. A simple silk chiffon gown by David Fielden, I came out of the fitting room and my sister burst in to tears and said that I had to have it, I took one look in the mirror and I knew she was right. My dress was really simple so I knew it could take a really statement headpiece. I wanted something that wrapped round my forehead that would work well with my hair down. I found exactly what I was looking for by Doloris Petunia on Etsy. Courtney Prince is the designer of the brand and she hand makes every piece of jewellery in Los Angeles then ships them to customers. When it arrived I actually squealed with excitement, it was more beautiful than the pictures and I think I loved it more than my dress. I also had a veil made by Margret from Dream Veils in Manchester. I wanted a Juliet cap veil that my headpiece could sit over. Margret was amazing, she designed and made a veil to fit perfectly and I think she was more excited than me about the finished result. My shoes were a limited edition pair by Ted Baker. I didn’t want traditional bridal shoes and had an idea of a gold sandal. I found a pair in Jimmy Choo that I loved but two wedding dresses later I think Kevin would have lost the plot if I came home with them. When I saw the snakeskin heel on mine I knew I wouldn’t be leaving the shop without them. We didn’t start with a colour theme for the wedding we just said that we wanted everything to be quite neutral. So when I took the bridesmaids dress shopping I didn’t have a clear idea of what colour the dresses should be. I also wanted the girls to choose their own dress, it was really important to me that the felt good in what they wore, as they are all very different if I put them all in matching dresses it would never work. We ended up in Coast and after trying on a few dresses I could tell straight away which ones they loved and they were all a beautiful champagne colour which I was more than happy with. We bought them there and then and went for cocktails to celebrate. We wanted a really relaxed feel to the day so Kevin told all the groomsmen to wear a suit they felt good in and not to worry about colour as we didn’t have a set theme. As it turned out they all turned up in navy suits purely by chance that matched Kevin’s perfectly it was as if we planned it. Although we wanted all the formalities of a wedding such as speeches, first dance etc. it was really important to us that our wedding had a really relaxed feel. The farm and the teepees helped to achieve this and the fact that we didn’t have a rigid colour theme we just kept everything really simple and neutral. Our family and friends helped with the décor, my mum made 100 meters of bunting; yes you read correctly 100 meters! My bridesmaid Rachel made paper doily pom poms and covered the hay bales in fabric for people to sit on outside. We also filled the tepees with large paper lanterns and giant round balloons filled with helium. There was lots of outside seating as well as the hay bales which meant that people could relax outside in the sun, some even put blankets down on the grass which made it feel like a wonderful garden party. All I knew about flowers was that I wanted lots of them and wanted it to look really natural in white, cream and pale pink. Jemma from Flowers by Jemma Holmes was fantastic. I took a few pictures with me of what I liked and she pulled out flowers that she thought I would love. She also at the last minute suggested some white hydrangeas for the tables and I’m so glad she did as they were my favourite. My bouquet consisted of sweet avalanche roses, astilbe, stocks and spray rose and the bridesmaid’s had balls of gypsophila. Kevin’s buttonhole was a thistle as my mums side of the family are Scottish and the groomsmen each had a little bit of gyp tied with twine. Jemma made all of these and I ordered all of the table flowers from her but I did the arrangements myself with a little help from my amazing friends the day before the wedding. This turned out to be a mammoth task but I was so pleased with the end result and felt quite proud of myself. The ceremony had to be by far my favourite part of the day. I was grinning ear to ear all the way down the aisle and as I got about half way I saw Kevin waiting for me with his bottom lip quivering, desperately trying not to cry and my smile got even bigger. We married in St Johns RC church in Alton which is right next to Alton castle and a truly beautiful setting. Kevin’s uncle is a Priest so he performed the ceremony and the first thing he did was get all the men to stand up and say hello to all the women, everyone got to have a hug and a little chat and made everyone feel really welcome and relaxed. It was a lovely way to start the ceremony and set the tone for the rest of the day. Kevin is very into his music so he was a bit wary of hiring a DJ. He used to be a bit of a local pub DJ in his younger days and still has all the equipment so he did a playlist for the night (he called it Mrs G’s dancey dance) and everyone commented the next day on how amazing the music was. Our first dance was “Silver words” by Sixto Rodriguez, it’s a song that Kevin has always loved and the first time he played it to me I fell in love with the lyrics so it felt like the perfect choice. Neither of us are big fans of canapés however, we are both very big fans of cake! So we decided to have red velvet cupcakes with prosecco and elderflower cordial for all our guests when they arrived. My very talented sister and her friend offered to make them for us and my equally talented auntie made our three-tiered Victoria sponge wedding cake which basically equalled a seriously sweet cake-tastic delight!! We wanted a formal sit down wedding breakfast but still wanted it to feel relaxed. Papakata introduced us to Lesley from Saunts, each course was a big dish that was put in the middle of each table with someone nominated to play mum and dish up. It made it really sociable and got everyone talking. So many guests commented on how amazing the food was, it was proper home cooked dishes that really suited the day. My parents live in France and offered to bring all the wine for the tables back with them, we bought carafes for each table and the Saunts team just kept on filling them up throughout the meal. It felt like we had an endless supply of wine that just kept coming, there was so much we were even able to keep it coming the next day at the BBQ. One of the most important aspects of the wedding for us both was that we wanted it to be really personal and reflect us as a couple. This meant that we did a lot of stuff ourselves. We made all the invites and orders of service as well as any other stationery. To tie it all together, we used the same typography throughout; such as the vinyl we had made for the light box. We also designed badges as favours for our guests. We attached these to luggage tags with guests’ names on which we pinned to a board then used this as the seating plan. We also designed stickers which the kids loved and stuck on just about everyone and everything. The most time consuming yet, rewarding DIY thing I did was to make Kevin’s wedding ring. I made it from a silver American half dollar from the year his Dad was born. It took me what felt like a lifetime but now he gets to wear something that I’ve made for the rest of his lifetime, it sounds cheesy but I love it. There was a lot of hard work involved and we had to prioritise what was most important but it was worth it when it all came together and it felt so personal to us. The best advice I can give is to make your day as much about the two of you as possible. Try and plan it together, Kevin was much more involved in the whole process than most grooms probably are and it was much more rewarding knowing that the whole day really did reflect us both. Many of our guests commented on how personal the service was this was because Kevin’s uncle was our priest and it meant a lot to us both that he could marry us, it also meant that there wasn’t a dry eye in the house especially Kevin’s!! (He cried a lot). The ceremony was by far my favourite part of the day, it’s the moment all the hard work and planning has been building up to and it’s an amazing feeling showing how much you love this one individual in front of everyone you care about. It’s so easy to get bogged down with the organisation of the reception but my advice is to put as much time and effort in to the ceremony, at the end of the day it’s the most important bit. One of the biggest decisions to make is choosing your photographer. We had a clear idea of the style of photography we wanted and as soon as we saw Harriet from Weddings Vintage previous work it was as if what we had in our heads was staring us in the face. Our main priority was that we wanted images that captured moments and reflected the feel of the day rather than endless posed photographs that steal you away from your guests for hours on end. This is Harriet’s speciality and not only that she makes them beautifully original by editing them in a way that gives them a very timeless, vintage feel. She also had the ability to put two people who hate having their picture taken completely at ease. The best decision I made throughout the whole planning process was to hire Laura Tickle. Laura is a wedding planner and also an angel sent from wedding heaven to sort out all your wedding problems. We hired her for on the day co-ordination, she took over a couple of weeks before the wedding and confirmed everything with all our suppliers. She also organised the timing of the day and was on hand from the getting ready stage to the first dance to make sure everything ran smoothly. This meant that Kevin and I could completely relax and enjoy the day without the stress of worrying about the details. She truly was an angel and every wedding should have a Laura Tickle! So did you adore this sunsoaked adventure as much as I did. Thought you might…. And aren’t Sarah and Kevin’s portrait shots the absolute sweetest…I love the one where Kevin is tilting Sarah’s chin; it’s intimate and loving all at the same time. Who else is thinking of having a totally epic headband like Sarah’s too? Next time I am! *if you want to sign up for the newsletter and haven’t done so already then sign up here. Possibly the most beautiful bride i’ve ever seen!! What a wedding!! Utterly gorgeous!!! 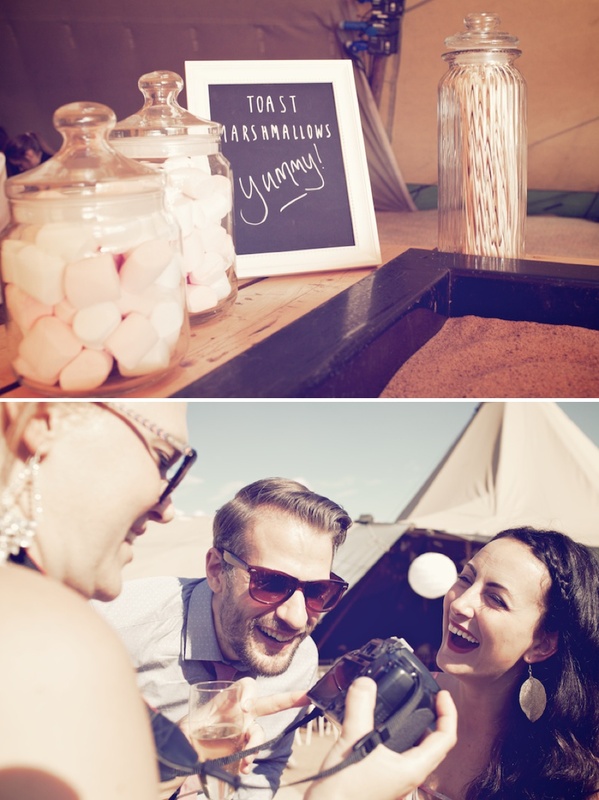 Also getting lots of inspiration from this one for our big day – we’re also using Papakata – they are amazing! The photography is SO beautiful!! What a beauty – the bride is blooming gorgeous and so effortlessly so! I love the shot of her chilling with her equally cool and gorgeous friends, the dress fits like a glove! Sarah’s hair is in fact amazing isn’t it? and her headpiece. And her FACE. I want some toasted marshmallows please. Ohhh wow – its Sarah in her veil!!! Thank you so much Sarah for your lovely words. Yes I really enjoyed making the veil it was fantastic to work with such a beautiful bride. OHHH and how beautiful does she look?? It was THE most amazing wedding & thank you for the lovely words. Although I’m biased, Sarah was the easiest/most beautiful bride to make up & she had really lovely, relaxed bridesmaids, we had a lot of fun. It’s the Bride here, just wanted to say a big thank you for all the lovely comments! Got a bit emotional seeing my mug on these pages. In response to the ring request I actually don’t have a pic but there are loads of how to videos on You Tube if any of you future brides are interested in having a go at making the ring. Sarah you looked amazing! I am thinking of purchasing the same headpiece (have had my eye on it for a while but I think this post just made my decision! )..Question – how did you get the headpiece to stay on with the veil under it? Did you have Courtney add ribbon to it? Thanks and congrats! Hi Jennifer, you should definitely get the headpiece it was truly amazing!! In response to your question, there are 4 small combs attached to the back of the piece where the silk petals are. These are supposed to keep it positioned on the head. I was planning on poking them through the veil however when I tried the headpiece on it was really heavy and was no way going to stay on my head for any length of time. I actually removed the combs and sewed a piece of invisible elastic to the back so it went round my whole head. This meant that my veil sat easily underneath and I just sat the headpiece on the top. You could probably ask Courtney to do this for you, a ribbon would do the same job but the good thing about the invisible elastic is that you can’t see it, it does exactly what it says in the tin! Good luck, hope you have an amazing day. Brilliant. Thank you! You looked so gorgeous! First off Sarah- wowzers! Not only are you a stunning bride, but the love between you and Kevin (as well as your friends and family) pours through these images. So happy for you and so utterly honored to be a tiny part of the beauty you created. Jennifer- were more then happy to add elastic like Sarah talked about, or customize your piece in anyway. Each of our pieces are made to order- so your wish is our command. 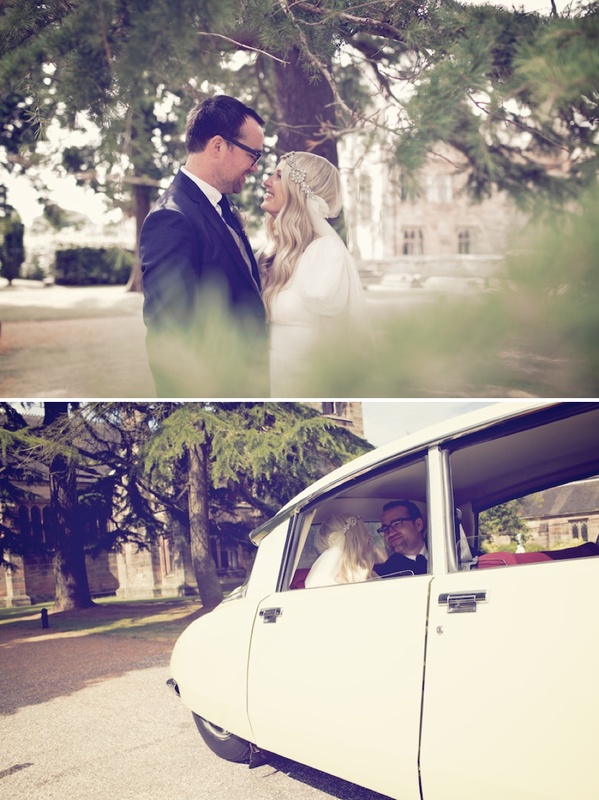 Sending lots of applause to Vintage Wedding for capturing this all so beautifully as well. Wow! Sarah looks fantastical! I can’t stop looking at your photos! You look absolutely beautiful and so in love! Just love your style & taste that shines through these photos! We’ve just booked our wedding & I have to admit I’m hoping to take some of your ideas as you’ve both created such a simple yet elegant vintage theme to your wedding day! The head piece & veil looked stunning Sarah and I’d love to order one of these however I can’t seem to find this on the website? I noticed you have been able to advise Jennifer & have had a response from Doloris Petunia herself!!! So I was hoping I could get some advise on finding the same headpiece & checking the price? I will check out the “Jamie” veil & possibly get back to you once I’v tracked down the headpiece & hopefully decided on a dress. We’ve only just booked our date and have just 6 months to go so it’s all systems go! Hi Sarah, thank you for your lovely comments and thank you Margret for the veil information. I will try and help with the headpiece hunt. I ordered mine from the Doloris Petunia Etsy page but I’ve just checked and it’s no longer on that site. If you go the website http://www.dolorispetunia.com and go to the bridal section it is available there. It’s called Layla and its $400, the one in the picture does look slightly different to mine as the are all individually made and do differ slightly. Hello Sarah, thank you so much for taking the time to help me out! I really do appreciate it! I’v bought my dress since I emailed and a veil they had which was a perfect match…so thank you Margret but it’s now all ordered…trying to keep it as simple as possible as we don’t have long to go. Hey, me again…please ignore the email & message I left regards your headpiece & requesting to meet up to see it. I finally found a headpiece (thank god) so will stop hassling you;)! So glad you have found something you love Sarah, I would have been more than happy to meet you though as I know how important it is to get it right and it’s so hard ordering something you have never even seen. Good luck with everything, have an amazing day and treasure every second. Thank you for your lovely message Sarah, and thank you again for your kind words & help! Wow… what a perfectly beautiful wedding! Sarah, do you know where your husband bought his grey textured vest for the day? My fiance loves his outfit!